CBS advertised CBS Season 10 and 11 on DVD just before this show started. Really? There's some kind of pent-up demand for seasons from five or more years ago? I would think that putting them on iTunes or even Netflix would be a better idea, but I don't run a major television network. Which, if I did, would have more professional wrestling and mixed martial arts on it than it does now. At any rate, teams from this season (available on DVD in 2019) are on their way to Scotland. Which I've been to and is really beautiful place. Max and Katie found an early flight online while everyone else went to the closed airport. Some teams couldn't get on the 1 p.m. arrival flight and were not getting in until 4. Max and Katie were on a flight that got in at 10:40 a.m. And then the hockey brothers and the country singers also found the 10:40 flight. Max and Katie weren't happy to see the other teams on "their" flight. Now that Stealth R Us is dead, Erik has suddenly realized that he actually has free will and can vote for who he wants. It's an amazing revelation. It's Brenda's turn to have a meltdown and Dawn is the voice of reason. Malcolm bid $480 for "information" and no one outbid him. (FOOLS!) 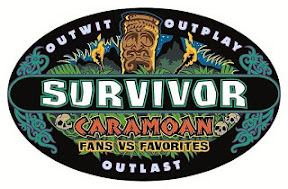 It was directions to the buried hidden immunity idol. Teams head to Dresden, Germany. By train, of course. And then on to the Ministry of Finance. All the teams were on the same train. On of the hockey brothers had his backpack taken on the train. He at least had his passport, so he could still continue in the race. Teams grabbed their cars and had to answer three political questions about the fall of the Berlin Wall from the in-car computer system before continuing. Teams had to drive themselves to Berlin to the Brandenberg gate. The clue at the gate told teams to make their way to the rooftop of a very tall building, where, naturally, nothing good can happen. Yup, a "base fly" of 37 storeys. Essentially they're jumping off the roof with a rope attached. That's ... terrifying. Watching last week's recap, it struck me how they can cram an hour's worth of narrative into a 90 second video package. Maybe I should be reviewing these on a week's delay and just use the previous episode recap instead. So, Dawn had this giant meltdown. Sobbing, blubbering meltdown. It had something to do with losing a retainer with fake teeth in it in the water. Brenda went diving for it and found it. The reward challenge was a muddy obstacle course. They were divided into 2 teams of 5 for a resort spa and lunch. The team of Secret Agent Man, Erik, Reynold, Dawn and Cochran won. Secret Agent Man jumped right into the pool without showering off the mud and rice from the challenge. And then he got naked. Dawn became convinced that Andrea will flip and vote her (Dawn) out. This led to another Dawn meltdown. And then she had a good night's sleep and she was fine. 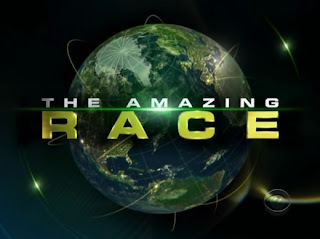 After a week off for the Country Music Awards, Amazing Race returns tonight on some channel not delayed by the Masters golf tournament, which finished up this evening following a sudden death playoff that seemed to last 15 days, in which one of the golfers, apparently, died. Suddenly. Or maybe that's just a figure of speech. The show opens with sad piano music and shots of monkey, and I'm worried my DVR has recorded the wrong show. A show about sad monkeys. Reynold notices that every girl who he associates with gets voted out. Malcolm realizes that he now has the only idol no one knows about. Secret Agent Man is wearing Oakleys in a very similar style to the ones I used to wear. My respect for him went up a bit. He inducts Sherri into Stealth R Us. She tells the camera that Secret Agent Man is crazy. Duh. Secret Agent Man tells Corinne and Dawn after Tribal Council that he threw the challenge. He was lying. They knew he was lying. He didn't know they knew he was lying. What a great intelligence officer he is. Corinne declared him, and I quote, "Cuckoo for Cocoa Puffs." A boat arrived to pick up Malcolm's tribe to take them to the home of the Disciples of Secret Agent Man. They all enjoyed the traditional merge feast and lime green buffs. They decide to call themselves Enil Edam. Which is Malcolm's mom backwards but he convinced them meant "new beginnings". Secret Agent Man pulls Andrea aside, drops Boston Rob's name again, and tries to pull her back into the Illuminati, or whatever he's calling his group of code-named supposed followers. Corinne and Malcolm plotted a move with a fragile six-person alliance to try to blindside someone.